CT Youth Leadership Forum now accepting applications. The CT Youth Leadership Program (CTYLP) provides youth and young adults, with disabilities, opportunities for self-discovery, the development of self-advocacy, decision-making, and problem-solving skills to maximize their leadership potential. The Youth Leadership Forum (YLF) is a FREE 4-day and 3-night leadership forum for high school youths that takes place at UConn's Storrs campus. Students who develop a Community Action Project for completion after the forum then become eligible for one of several CTYLP scholarships. We are helping families, 6 days a week. It’s your choice, how do you want to travel? A community-based and community supported service. · Check out our web site for pricing. Seniors and people with visual impairments will want to walk for Nutmeg Senior Rides. This program fills a crucial gap if you want another option, and a better choice for transportation, it is Nutmeg Senior Rides. We hope that you can help your community! We are going inside the Enfield Square Mall on March 12, 2016. Registration is at 10 AM and the Walk starts at 11 AM. We will have an information Kiosk from January 15 on in the Mall. Evan White will be our MC from WSFB and will have promotional spots on WMAS from mid-February to the Walk. email or register online through www.NutmegSeniorRides.org. Sarah Biglow, CT native and national author is KEYNOTE! Good afternoon Deaf Rec Community and friends! We are happy to announce that there will be a Pre-Super Bowl Party held on Sunday, February 7 form 1:00 - 4:00 p.m. at the American School for the Deaf, Cogswell Café. Pizza, wings, soft drinks, and more will be provided. This is a free event but we do ask that you RSVP in advance so we have enough food for everyone. There will be games, activities, great food, and fun for all. We hope you can attend! There will also be Bowling at Bowl-O-Rama on Saturday, February 20 from 1 - 3:30 p.m. Bowl-O-Rama is located at 2143 Berlin Turnpike, Newington, CT. For directions, please visit - http://www.bowloramact.com/site/index.php/contact-us/directions.html. This event is also free of charge and food and beverages will be provided. Remember to "Like us" on Facebook for up to date information on the Deaf Rec Community at https://www.facebook.com/deafrec/. Gov. 's recent statements about Southbury Training School are simply wrong. The residents there do not constitute "extraordinary cases." There are people with the same, and in some cases even more complex, disabilities living in the community and receiving high quality care at a fraction of the cost. Data from the state Department of Developmental Services disprove his argument. Moreover, there are individuals with needs every bit as complex who are denied residential services and forced to live in increasingly perilous conditions in their aging parents' homes until the last caregiver is permanently incapacitated or dies. In addition to being wrong about the Southbury population, the governor is wrong that individuals with intellectual disabilities, even if they have complex needs, can only live in institutions. Fifteen states and the District of Columbia have closed all their institutions, and many states, including Connecticut, have closed one or more. If he is correct, then all of these states are wrong, as is the research done by experts in this field. What does the research show? Without exception, people with intellectual disabilities leaving institutions, including those leaving Connecticut's Mansfield Training School, do better in the community than they did in institutions, and that those who do best are those with severe or profound disabilities. These results include elderly residents who move to the community, and individuals who move after living in institutions for 20 years or more. The governor's misstatements about Southbury could have been avoided had the Department of Developmental Services shared its data with him. According to the agency's detailed staff analysis, the overwhelming majority of Southbury residents could in fact move to the community. Information, which apparently was not provided to the governor, effectively contradicts his flawed position that institutions, in some form, are necessary. This lack of information from the Department of Developmental Services, and the consequent lack of understanding of the issue, has placed the governor in an uncomfortable position. On numerous occasions, he has spoken out strongly to vindicate and advance the civil rights of the powerless and dispossessed. But on this issue - the institutionalization and segregation of individuals with disabilities - he is not in the vanguard of change, but instead finds himself allied with the discredited forces of the status quo. Acting on all of the research, and as important, on the data and figures from his own administration, the governor should use his executive authority today to order the closure of Southbury, and direct the Department of Developmental Services Commissioner Morna Murray to reinvest the savings realized to support the thousands of individuals languishing on the department's residential waiting and planning lists. Last year, according to the Office of Fiscal Analysis, the Department of Developmental Services managed to take only 11 non-emergency placements off the waiting list. This shameful record is not the hallmark of a governor concerned about people with intellectual disabilities, but instead a sad testament to the injustice of a system burdened with exorbitantly expensive institutions that, inexplicably, Connecticut chooses to operate. Institutions that are outmoded, professionally discredited, and could not be opened under current law. 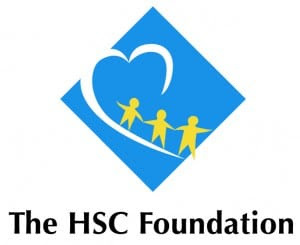 If the state were to close Southbury and its five regional centers and put the savings back into the developmental services system, a thousand people would come off the waiting list, and every institutionalized person could still receive high quality care from the host of extremely competent private residential providers. In addition to visiting Southbury, I urge the governor to visit a family home to see what a day in the life of a waiting list family, deprived of funding due to Connecticut's exorbitantly expensive institutional system, is like. Or perhaps to visit the home of one of the 76 individuals who moved into the community from Southbury in the last five years. Perhaps then he would know what we know: Institutions are not only unnecessary, their wildly disproportionate costs are depriving desperate families of the services they need. The legislature, to its credit, has started us down the path to closing our institutions. Statements like the governor's that contradict all research and misstate his department's data do a grave disservice to those with intellectual disabilities who are ultimately the victims of Connecticut's ineffective and inefficient system. Leslie M. Simoes is executive director of The Arc Connecticut. 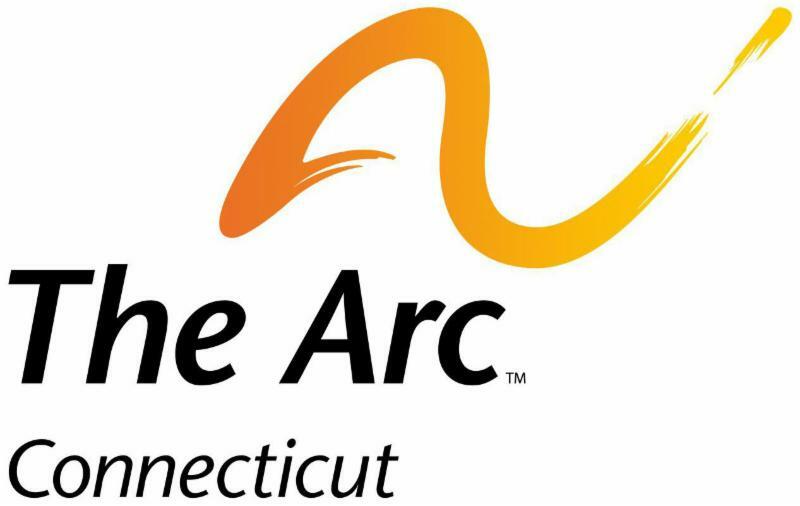 DONATE NOW to support The work of The Arc Connecticut! The Autistic Self Advocacy Network is now accepting applications for the 2016 Autism Campus Inclusion (ACI) Leadership Academy! The ACI summer leadership training prepares Autistic students to create systems change on their college campuses. View and download the application here. Accepted applicants will travel to Washington, DC and participate in advocacy training at Gallaudet University from May 28 to June 4, 2016. Participants will acquire valuable skills in community organizing, policy formation, and activism. Travel and lodging are fully covered by ASAN. Applicants must identify as Autistic and be current college students with at least one year remaining before graduation. The Autistic Self Advocacy Network will cover travel and lodging costs for all ACI students. We especially encourage students of color, LGBT students, students with intellectual disabilities, AAC users, and students from other or multiply marginalized communities to apply. View and download the 2016 application here. This New Year, resolve to promote positive behavioral health in your community. SAMHSA has resources that can help address some of the toughest mental health and substance use challenges, including suicide prevention, bullying prevention, behavioral health following a disaster, and underage drinking prevention. Suicide Safe helps health care providers integrate suicide prevention strategies into their practice and address suicide risk among their patients. KnowBullying provides information and guidance on ways to prevent bullying and build resilience in children. A great tool for parents and educators, KnowBullying is meant for kids ages 3 to 18. SAMHSA Disaster App provides responders with access to critical resources—like Psychological First Aid and Responder Self-Care—and SAMHSA's Behavioral Health Treatment Services Locator to help responders provide support to survivors after a disaster. Talk. They Hear You is an interactive game that can help parents and caregivers prepare for one of the more important conversations they may ever have with children—underage drinking. for his job interview, they allegedly canceled the interview and wouldn't reschedule it. For more information about the ADA and other laws that protect the rights of people with disabilities check out Disability.gov's Guide to Disability Rights Laws. FEMA’s Office of Disability Integration and Coordination is now accepting applications for several full-time vacancies at FEMA HQ and across the US. ODIC’s mission is to lead and achieve whole community emergency management, inclusive of individuals with disabilities, and others with access and functional needs. The office provides guidance, tools, methods, programs and strategies for physical, program and effective communication access before, during and after disasters. To view and apply for these positions or for full information, including key requirements and a description of duties, please click the following links provided below to access the job announcements through USAJobs.gov. These announcements will close on December 18, 2015 OR the date the 200th application is received, whichever comes first. If you have any questions, please contact Mia Burke at or by phone number 202-212-4693. Action Alert: NCIL Needs Your Help Documenting the Impact of the DOL Rule Changes! In August, when the Court of Appeals ruled in favor of the DOL, the Home Care Association said that they were considering a Supreme Court appeal and asked if NCIL and ADAPT would be willing to write another amicus in that case. 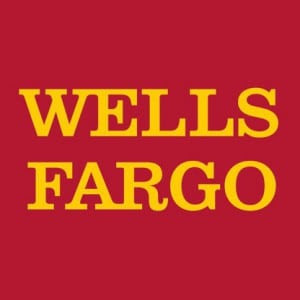 Months went by and they filed a petition to appeal to the Supreme Court with a motion asking the court to delay the implementation of the DOL rule until the Supreme Court decided if it would hear the case. The Supreme Court declined to delay the rule, but is allowing the Home Care Association to petition to have the appeal heard by the Supreme Court. The Home Care Association is, in fact, moving forward with petitioning the court and asked if we would file an amicus with a deadline of December 24, 2015. This brief is simply asking the court to hear the case. We are crafting an amicus emphasizing that the Court should hear the case because the DOL's actions in changing the regulations have been harmful to attendants and attendant service users. In order to draft an accurate brief for the Supreme Court about how the Companionship Exemption changes have impacted people with disabilities, we need your help! Please answer the questions below with details by Monday, December 14th! Send answers to Stephanie Woodward at . Explain how any state policies around attendant services have changed within the last 18 months. An example of this would be any rules implemented by your state that prohibit overtime for attendants. Explain how any practices changed within the last 18 months. An example of this would be fiscal intermediaries requiring attendants to stop working overtime or people being reevaluated and receiving reduced hours that limits the potential for overtime. Share stories of anyone who has been affected personally. Has an attendant lost hours of work? Has a disabled person lost their attendants because of this? Is it impossible to find new attendants? Has anyone been institutionalized as a result? These examples will be very helpful to highlight the harm that is happening because of these rules. Has your state done nothing to implement the rule? Thank you for your help in addressing this critical issue! Peer Support; and Photography with "No Boudaries"
Brian wants to go to photography camp by himself, he excitedly explains on the day of his photo shoot. This is a big deal for the teen, who has autism. 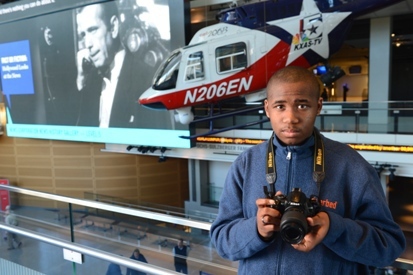 With a camera hung around his neck, he takes in the sights at the Newseum in downtown Washington, D.C. A giant screen shows a looping video; a news helicopter is suspended from the ceiling. Brian lifts his camera, focuses the viewfinder and clicks the shutter – capturing the moment perfectly. Brian’s passion for photography began three years ago when he was in the sixth grade. He had always been fascinated by people with cameras. In fact, it was the only time he would leave his mom’s side, she says as she watches her son pose, now the subject of a photographer. For the last few years, he has been very active in not only pursuing, but manifesting his innate passion for photography. He picked out his first camera by himself, after carefully researching online reviews and selecting a popular model that was widely agreed upon as a great option for first-time users. 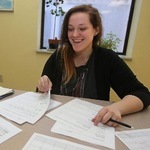 By Guest Blogger Caitlin Neumann, President of the Board of Directors, YOUTH POWER! Being a teenager is hard when you’re trying to balance school, family, your social life, mental and physical health and plan for your future. So, what are you supposed to do when you’re trying to maintain all of that on top of struggling with a mental illness? Who do I ask for help? Where can I get answers? Why does nobody understand? After being diagnosed with depression and anxiety, these are the questions I asked myself for years – a constant internal dialogue on repeat. At 15 years old, I felt alone, judged and hopeless. Disability.Blog, the official blog of Disability.gov, features weekly posts from subject matter experts who address important topics for people with disabilities, their families and others. Introduced in 2011, the "No Boundaries" Photo Project profiles individuals with disabilities, capturing the diverse skills, talents and life stories of each. Read other "No Boundaries" stories on Disability.Blog. We join President Obama and communities around the world in observing the International Day of Persons with Disabilities . This day was first proclaimed by the United Nations General Assembly in 1992 to promote action and raise awareness about disability issues and draw attention to the benefits of an inclusive and accessible society for people of all abilities. This year’s theme is “Inclusion Matters: access and empowerment for people of all abilities.” Around the world, people with disabilities face far too many physical, social, and attitudinal barriers that prevent them from fully participating and thriving in the community. The obstacle can be an inaccessible building, a discriminatory law, abuse or neglect, or the expectation of failure. Over the past year, ACL Administrator Kathy Greenlee has joined colleagues from the Department of State and U.S. Agency for International Development to bring attention to the barriers faced by people with disabilities across the lifespan globally at international meetings including the 70th United Nations General Assembly and the 59th United Nations Commission on the Status of Women. Promote independent living for people with disabilities. Investigate suspected abuse and neglect and provide legal advocacy services for people with disabilities. Increase access to assistive technology for people with disability. Empower people with developmental disabilities and their families to become leadersactively helping to make systems more effective and efficient. Conduct and put into practice cutting-edge research on disability, rehabilitation, and independent living. The U.S. Equal Employment Opportunity Commission and the U.S. attorney's office have stopped an illegal land deal that would have prevented over half a million dollars from being paid to 32 people with intellectual disabilities. The individuals were former employees of Hill Country Farms, Inc. (doing business as Henry's Turkey Service) of Mills County, TX. In 2013 a jury found that for years the intellectually disabled men went unpaid and were subjected to substandard living conditions, restrictions on personal freedoms, denial of medical care and harsh discipline as well as verbal and physical harassment. Discrimination based on a person’s disability violates the Americans with Disabilities Act (ADA). For more information about the ADA and other laws that protect the rights of people with disabilities visit Disability.gov's Guide to Disability Rights Laws. If you are a Social Security disability beneficiary and want to make more money through work, Ticket to Work can provide the support you need to transition to financial independence. Register online at http://www.choosework.net/wise or call 1-866-968-7842 (V) or 1-866-833- 2967 (TTY). Approximately 2 days before the event, you will receive an email with instructions on how to log in to the webinar. Please be sure to check your spam folder. Registration information will also be available online the day of the webinar. Questions? Email us at or call 1-866-968-7842 (V) or 1-866-833- 2967 (TTY). You will receive a registration confirmation message with instructions on how to log in to the webinar. Please be sure to check your spam folder. Registration information will also be available online the day of the webinar. Email Ticket to Work at or call 1-866-968-7842 (V) or 1-866-833-2967 (TTY). Follow Ticket to Work on Facebook! Follow Ticket to Work on Twitter! Follow Ticket to Work on LinkedIn! Watch Ticket to Work Success Stories on YouTube! Help promote the use of Social Security’s online service options. You will receive a link to the webinar via email after registration closes. Join the millions and discover your benefits! Open a my Social Security account. You are subscribed to Connecticut Weatherization Assistance Program for Benefits.gov. The benefit program details have recently been updated, and are now available. You are subscribed to Special Education Parent Information Centers for Benefits.gov. The benefit program details have recently been updated, and are now available. You are subscribed to Independent Living Services for Older - Blind Individuals for Benefits.gov. The benefit program details have recently been updated, and are now available. You are subscribed to Assistance for Infants and Toddlers with Disabilities for Benefits.gov. The benefit program details have recently been updated, and are now available. The U.S. Department of Justice (DOJ) has reached a settlement with the Golden Corral restaurant in Farmington, NM over violations of the Americans with Disabilities Act (ADA). The department's investigation showed that the restaurant needs to make architectural changes, including making designated accessible parking spaces available, in order to be accessible to people with disabilities. The investigation was part of Project Civic Access, a DOJ initiative that makes sure that cities, counties and businesses throughout the country comply with the ADA. To learn more about the ADA read the July issue of the Disability Connectionnewsletter, 10 Things to Know about the Americans with Disabilities Act. The State Office of Protection and Advocacy for Persons with Disabilities is offering trainings on disability-related voting rights. Topics include registration; voting technology; voting while in the hospital or other facility; polling place accessibility; and more. Now is the time to get educated! Primaries (for those towns that will have them) will be on Wednesday, September 16; the General Election is on Tuesday, November 3. The U.S. Equal Employment Opportunity Commission has charged Magnolia Health Corporation and its affiliates with disability discrimination under the Americans with Disabilities Act (ADA). The Visalia, CA based company runs health care and assisted living facilities throughout California's Central Valley. Since 2012, Magnolia and its affiliates have allegedly refused to hire job applicants because of their disabilities and failed to provide accommodations for, and also fired, employees with disabilities. Looking for more information about the ADA and other laws that protect the rights of people with disabilities? Visit Disability.gov's Guide to Disability Rights Laws. The U.S. Equal Employment Opportunity Commission has charged IDEX Corporation with disability discrimination. IDEX, which has locations around the country, including many in Florida, allegedly violated the Americans with Disabilities Act (ADA) when it fired an employee due to his disability. While the employee was undergoing treatment for cancer, he was repeatedly subjected to personal medical questions and asked about his ability to do his job. He was then fired because of his disability. For more information about the ADA and other laws that protect the rights of people with disabilities, visit Disability.gov's Guide to Disability Rights Laws. The U.S. Access Board has released new chapters for its online guide to accessibility standards under the Americans with Disabilities Act (ADA) and the Architectural Barriers Act (ABA). The new installments include information about requirements for accessible routes, including doors, ramps, elevators and exits. It also has an animated video on hazards that protruding objects pose to people with vision impairments. The guide covers design requirements for places of public accommodation, commercial facilities and state and local government agencies covered by the ADA. The Federal Emergency Management Agency (FEMA) and the Ad Council have released a new public service advertisement (PSA) to raise awareness about the importance of being prepared for emergencies. "We Prepare Every Day" is the first in a series of videos that show people with disabilities taking steps to prepare themselves and their families for emergencies. The PSA includes open captioning, a certified deaf interpreter and audio descriptions. Want more information about how to prepare for an emergency or disaster? Read Disability.gov’s Guide to Emergency Preparedness and Disaster Recovery. This will be a public discussion concerning the opportunities, obstacles and challenges that persons with disabilities face in both public and private employment today. Participants are encouraged to keep their comments to no more than four minutes so that we may hear from everyone who would like to speak. Written testimony will be accepted in addition to, or in lieu of, any oral testimony. Attendees should be mindful that persons with disabilities will be in attendance, including those with chemical sensitivities, and should plan accordingly. To RSVP or request an accommodation please contact Lewis Letang at (860) 263-6573 or E-mail . Attached is a comprehensive list of ADA 25th Anniversary Commemoration events going on across the state. On July 10, 2015, the FCC announced deadlines for the public to submit comments and reply comments on issues related to making emergency information on television more accessible to individuals who are blind or visually impaired. Background. In 2013, the FCC adopted rules that require emergency information on television that appears visually during a non-news program (such as in a text crawl displayed during a regularly scheduled program) to be provided aurally on the secondary audio stream. These requirements stem from the Twenty-First Century Communications and Video Accessibility Act of 2010 (CVAA). Recent Rule Changes. In May 2015, the FCC expanded these rules. · The new rules require that manufacturers of equipment used to receive and play back television programming, such as set-top boxes, have a simple and easy-to-use mechanism to switch from the main program audio to the secondary audio stream to hear audible emergency information. The compliance deadline for this requirement is December 20, 2016. · In addition, the new rules require that emergency information be made accessible on a secondary audio stream on “second screens,” such as tablets, smartphones, laptops, and similar devices when subscription television providers, such as cable and satellite operators, permit subscribers to watch scheduled programming over their networks using an app on these devices. The compliance deadline for this requirement is July 10, 2017. · whether to require subscription television providers, such as cable and satellite operators, to ensure that the devices and apps they provide to subscribers to watch scheduled programming over their networks include a simple and easy to use activation mechanism for accessing audible emergency information on the secondary audio stream. Due Dates for Comments.‎ Comments must be submitted by August 10, 2015, and reply comments must be submitted by September 8, 2015. The followings are links to the May 2015 Second Report and Order and Second Further Notice of Proposed Rulemaking and to the July 2015 Public Notice announcing the deadlines for comments are reply comments. For further information, contact Evan Baranoff, Media Bureau, at 202-418-7142 or e-mail .